It is often said that the invention of terrible weapons of destruction will put an end to war. That is an error. As the means of extermination are improved, the means of reducing men who hold the state conception of life to submission can be improved to correspond. According to the theory of Near Term Extinction (NTE) the human race is about to go the way of the Dinosaurs. Though polls on the subject are scarce, it is safe to assume that the majority of humanity disagrees. Most of us remain at least cautiously optimistic about our long term survival prospects. Notable exceptions can be found amongst various apocalyptic cults, whose followers anticipate near term divine intervention, as well as trans-humanists, who anticipate the rise of post-humans due to exotic new technologies. In contrast to these worldviews, NTE is not rooted in religion or science-fiction but a pessimistic reading of the environmental sciences, probability theory and the law of unintended consequences. Nor is NTE limited to the fringe. A growing number of scholars, including highly visible figures like Stephen Hawking and Richard Dawkins, have suggested that near term extinction is plausible, though certainly not inevitable (predictions range from years to decades to centuries). Since the collapse of the Soviet Union, environmental crises such as climate change have supplanted global thermonuclear war in the pessimist’s hierarchy of doom. Yet these threats are not mutually exclusive. A leaked 2004 report by the Pentagon on global warming anticipates increased risk of “Nuclear conflict, mega-droughts, famine and widespread rioting…Once again, warfare [will] define human life.”1 Though such predictions are self-serving – environmental crises are deemed yet another threat that can only be contained by militarism – they are also rational. Under state capitalism, competition for diminishing resources may exacerbate violent conflict, creating a feedback loop not unlike global warming itself. This essay will argue that if the human race is to survive, anarchic systems based on participatory democracy must replace top down models of state rule. In his book The McDonaldization of Society, sociologist George Ritzer portrays rationalism as a paradox: highly rational models frequently produce highly irrational outcomes.2 The modern workplace, where we spend most of our waking hours, provides a familiar illustration: rationalist modes of production based on efficiency, calculability, predictability and control have reduced large swathes of humanity to human resources, disposable entities afforded little in the way of self-determination and dignity. In Charlie Chaplin’s Modern Times (1936), the Little Tramp himself becomes part of the assembly line, compelled forward by gears and pulleys, sliding through the bowels of the machine. When it comes to international affairs, rationalist models generally fall under the heading realpolitik, a term used to denote both cynical amorality and unflinching “realism” by political leaders acting for a perceived greater good. Unlike idealist interpretations of the state, which focus extensively on ethics, realpolitik is primarily concerned with power. The Italian philosopher and diplomat Niccolo Machiavelli (1469-1527) wrote, “How we live is so far removed from how we ought to live, that [the ruler] who abandons what is done for what ought to be done, will rather bring about his own ruin rather than his preservation.”3 Since the ruler’s primary objective is to maintain power, immoral behaviour is not only acceptable but necessary. The 19th Century anarchist Mikhail Bakunin agreed with Machiavelli’s cynical understanding of power but came to very different conclusions about how humanity should proceed. He bitterly praised the Italian philosopher for exposing the state with “terrible frankness,” and demonstrating that “crime… is the sine qua non of political intelligence and true patriotism,” yet rejected the notion that such crime was inevitable. “We are the sons of the revolution… We believe in the rights of man, in the dignity and necessary emancipation of the human species.”5 The state – as well capitalism – should be abolished. The military establishment, soon to be termed the military industrial complex by President Eisenhower, did in fact have another purpose, namely to expand American power through imperialism. Tolstoy was proven correct: not even the creation of the most “terrible weapons of war” would put an end to the state’s quest for dominance. Few people who consider themselves rational would advocate for the disarmament of the state apparatus in which they live. Yet in the age of nuclear weapons, it is precisely this insistence on “national security” through state power that is most likely to kill us. If, as Bakunin argued, “small states are virtuous only because of their weakness,”5 powerful states demonstrate an ineluctable tendency toward dominating others. The result is militarism. The history of civilization is sufficiently blood-soaked that many modern intellectuals, including Albert Einstein, have argued that competitive state frameworks must be abandoned if the human race is to survive. It is doubtful that a world government such as envisioned by Einstein – which allowed for the centralization of “offensive weapons” – would have eliminated the nuclear threat, let alone war, if for no other reason than secessionist movements and other power struggles would have remained a constant concern (we will return to this subject at the essay’s closing). The new paradigm was MAD – Mutually Assured Destruction. Because man is a rational being, he would not risk annihilation by attacking his foe. Game theorists at the Rand Corporation, a Pentagon think tank, provided the theoretical basis. According to the prisoner’s dilemma, both players had to assume the other was rational. While most nuclear strategists took it for granted that the point of the game was to maintain peace between the super-powers, others believed, quite logically, that the point of the game was to win it. Among those who embraced the “winner takes all” view was General Curtis Lemay, purported model for the character “Jack the Ripper” in Stanley Kubrick’s Dr. Strangelove. Best known for masterminding the massive bombing campaign against Japan during WWII (which resulted in half-a-million dead and about five million homeless), Lemay headed up the Strategic Air Command and served as Chief of Staff of the U.S. Air Force from 1961 to 1965. Equally disturbing as the super-hawks at the Pentagon were the numerous academics – people who considered themselves highly rational – who advocated a similar strategy. Most found their home at the Rand Corporation. MAD is widely regarded as a triumph of both rationalism and hard-nosed realpolitik. The missiles stayed in their silos. We didn’t go extinct. Starry-eyed idealists who rejected Ronald Reagan’s belligerence and exorbitant military spending were proven wrong. What few realize is that we escaped destruction primarily due to a handful of individuals who rejected the chain of command – and even the logic of their computer screens – in order to embrace the better angels of their being. In my documentary film The Power Principle, I explore several of the biggest “close calls” during the Cold War. The most serious event occurred during the Cuban Missile Crisis. In the midst of the conflict, a group of United States Navy Destroyers began dropping practice-depth charges on a Soviet submarine positioned near Cuba in order to force it to the surface. The sub commanders believed WWIII was underway. In 1983, a computer malfunction at a nuclear warning facility near Moscow falsely indicated a nuclear attack by the United States. The probability indicator was at level 1. The man in charge, Stanislav Petrov, did not have the ability to launch a retaliatory strike. However, were he to pass on the information to the top command, the Soviet leadership would have only had a few minutes to decide on whether to launch a counter-attack. According to Bruce Blair, a Cold War nuclear strategist, “the top leadership, given only a couple of minutes to decide, told that an attack had been launched, would [have made] a decision to retaliate.” Petrov broke military protocol, and waited. The third biggest close call occurred in the same year when NATO began a war exercise; the scenario – an all out nuclear attack on the Soviet Union. It was codenamed Able Archer. When the Nazis invaded the Soviet Union during WWII, they did so under the guise of a war game. Alarmed by Ronald Reagan’s “evil empire” rhetoric, as well as America’s deployment of Pershing II strategic missiles in Europe, hard-liners in the Kremlin became convinced that history was about to repeat itself. In the run up to the exercise, the Soviets secretly mobilized all key components of their military forces, including nuclear submarines. One mistake by either side and a holocaust would have resulted. For critics of American foreign policy, the failure of US leaders to pursue a peaceful path following the collapse of the Soviet Union is often attributed to a uniquely American belligerence or depravity. Yet a cursory glance through the history books shows that the American empire, while exceptional in terms of global reach and technology, is anything but exceptional in terms of base motivation; it is behaving in a remarkably similar fashion to every empire that preceded it. We can only conclude that powerful states – and the people to tend to wield great power within them – share peculiar forms of logic that are alien to most of their citizenry. In both egalitarian and hierarchical societies, power is jealously guarded. For egalitarians, the goal is to maximize freedom through group solidarity; for despots, the goal is to maximize the “freedom” of rulers to oppress the majority. Among political philosophers, only anarchists have seriously considered the threat posed by hierarchy in human affairs. For this reason they have been labeled “utopian.” Yet it may be that idealized notions of benevolent hierarchies are not only unrealistic but wildly implausible. Just as systems of domestic law have proven incapable of preventing tyranny, so too have international laws utterly failed to prevent war. For anarchists, the reason for this is self-evident: the logic of power is power. There is no law or principle so compelling that it will not be tossed aside at the first sign that those who hold power are in danger of losing it. Hunter-gatherers are able to prevent social dominance hierarchies because they act in a group wide coalition; under the state apparatus, with its entrenched hierarchies, this ability is severely curtailed. Great powers may temporarily “check” one another, to the point where – depending on the global power configuration – some powerful states may seem positively benign; nevertheless, by their very nature, states must exist in an environment of perpetual conflict; when a “critical quantity of power” is reached by one state in relation to others, war is a likely result. For these and other reasons, Bakunin believed that international law is always destined to fail. There is no common right, no social contract of any kind between them; otherwise they would cease to be independent states and become the federated members of one great state. But unless this great state were to embrace all of humanity, it would be confronted with other great states, each federated within, each maintaining the same posture of inevitable hostility. War would still remain the supreme law, an unavoidable condition of human survival. When NATO was created in 1949, its ostensible purpose was to protect Europe from the Soviet Union. Yet when the Soviet Union collapsed in 1991, NATO did not; in fact, it expanded. Speaking in 2005, American military geostrategist Thomas Barnett boasted that since the collapse of the Soviet Union, “demand for our services has increased 4-5 times.”14 Instead of the “peace dividend” promised by Bill Clinton, aggressive war by the United States actually escalated. Twenty years after Perestroika, Gorbachev lamented that his concessions – rather than creating more peace and harmony – had produced a “winner’s complex” among the American political elite.25 Gorbachev had envisioned for post-Soviet Russia a social democracy similar to the Scandinavian nations. What actually followed were a series of brutal “free market” reforms engineered by technocrats from the Chicago school of economics. It took decades for Russia to regain some semblance of stability. Now that it has – and despite the vanished pretext of an ideological battle between capitalism and communism – the Cold War is back with a vengeance. When Gorbachev allowed for the peaceful dismantling of the Soviet Union, he was promised by George H.W. Bush that NATO would not expand “one inch to the east.”14 Instead, NATO has expanded to much of the world – including Eastern Europe, the Caucasus, the Baltic and Central Asia. Coinciding with these aggressive policies of expansion and encirclement, the US has insisted on establishing anti-missile systems in Poland designed to eliminate Russia’s nuclear deterrent. The desire by Russian leaders to retain control of their Black Sea port in Crimea and to project power into neighbouring (NATO-affiliated) states is a classic expression of the cordon sanitaire or “quarantine line.” In state-craft, the term is defined as a protective barrier against a potentially aggressive nation or dangerous influence. Putin has not been without his own forays into military violence, such as the brutal subjugation of Chechnya in the mid-90′s (during which the capital, Grozny, was largely reduced to rubble). Nevertheless, the Russian leader has focussed most of his attention on building economic alliances, most notably that of the BRICS (Brazil, Russia, India, China and South Africa). Apart from the small matter of nuclear weapons, it is in the economic realm that Russia is considered most dangerous. Russia provides the European Union with about a third of its gas, remains one of Germany’s largest trading partners, and has arranged a massive natural gas supply deal with China. In the same way that NATO has attempted to encircle Russia, the Pentagon’s “Asia pivot” seeks to quarantine China militarily. China has responded by announcing a new Air Defence Identification Zone in the East China Sea, overlapping disputed territories with Japan. In April, the US established a new “Defence” pact with the Philippines. Russia and China have repeatedly vetoed US-sponsored Security Council Resolutions that would have allowed for the legal bombing of Syria (which houses one of Russia’s last foreign military bases outside of the former Soviet Union). Yet this has not prevented the United States from attempting to subvert the Syrian government through semi-covert means. The CIA, the British SAS, Saudi Arabia, and NATO member Turkey have been training and supplying Syrian rebels in Jordan and elsewhere since the beginning of the insurgency against Syrian president Bashar al-Assad.29 Syria, in turn, has a mutual defence pact with Iran. As always in the recent history of the Middle East, the wild card is Israel. The destruction of Iran remains Israel’s primary foreign policy objective. Although Hezbollah has sensibly warned that an attack against Iran would “set the entire middle east ablaze.”30 Israeli leaders perceive Iran as a potential counter-check to Zionist power. In addition to geopolitical concerns, Israeli leaders embrace a peculiar military strategy known as the “Mad Dog” doctrine. First articulated by Israeli military leader and politician Moshe Dayan, it calls for Israel to behave “like a mad dog, too dangerous to bother.”31 North Korea seems to have embraced a similar strategy, though to considerably less effect. Here we may say that while Biden’s actions may have been insane during the Eisenhower administration, they are perfectly logical under the Obama administration. In keeping with the theory of the Power Principle, or Kohr’s notion of “critical quantities of power,” the collapse of the Soviet Union eliminated the primary check to the American empire. The dogs of war could be fully unleashed. Now that Russia is resurgent, and the US declining economically, there is a great deal of barking going on. Rasmussen is nothing if not worldly, considering that “his” people evidently include populations from countries as varied as Albania, Croatia, Canada, France, Iceland, Italy, Romania, the UK and the USA. The illegal bombing of Serbia by the Clinton administration may be regarded as the starting point in the New Cold War, for it was during the assault that NATO began its eastward shift. Considerably less rational was the behaviour of US General Wesley Clark during the conflict. According to British pop singer James Blunt (best known for his song “You’re beautiful”), who commanded 30,000 NATO troops in Bosnia, he was instructed by the US General to attack a squadron of Russian soldiers at the Pristina Air Base. In contravention of the Nuclear Non-Proliferation Treaty, which demands “good-faith” efforts to work toward nuclear disarmament, the United States is projected to spend 1 trillion maintaining and expanding its nuclear weapons systems over the next 30 years39 – assuming we survive that long. No state, no matter how powerful or totalitarian, is capable of engaging in aggressive war absent ideological justification. These justifications typically take on two forms: a noble cause that the public can relate to and a cause that – though it would seem brutal and even immoral to the public – is deemed rational by members of a particular ruling class. Very often, a casus belli (or war pretext) will be manufactured by leaders to coerce a peaceful population into accepting war, though intensive propaganda is often sufficient. In the modern age, covert agencies like the CIA have allowed for a more cost-effective and PR-friendly alternative to transparent military aggression. Black operations are especially useful for the United States because the over-arching propaganda narrative (“freedom,” “democracy,” “human rights”) is diametrically opposed to the brutal realities of American foreign policy. Eisenhower’s concept of the Military Industrial Complex is better described as the Military Industrial Intelligence Complex. Kennan helped to establish the Office of Policy Coordination inside CIA.42 Despite its intentionally bland title, the OPC specialized in black operations: assassinations, torture, coups, false flags. Its officers did in the dark “what would have never stood the light of day”43 in a self-proclaimed democracy committed to freedom and human rights. After the attacks of 9/11, these tactics were brought out into the open – a dangerous gambit that has undermined America’s moral legitimacy both at home and abroad. According to former CIA analyst Ray McGovern, the “neoconservatives” who would come to dominate the George W. Bush and Obama administrations were described by fellow analysts – in the 1970′s/80′s – as “The Crazies.”44 The neocons openly argued for war as a way of life, and for the projection of American power into every corner of the globe. “Ideas do not succeed in history by virtue of their truth,” writes sociologist Peter Berger, “but by virtue of their relationship to specific social processes.”45 Following the collapse of the Soviet Union, and coinciding with the increasing power of the Israeli Lobby, the neocon philosophy suddenly became not so crazy after all. It now had utility, and was widely accepted. The philosophical “Godfather” of the neoconservative movement was the philosopher Leo Strauss. Born in Germany of Jewish parents, he emigrated to the United States and took up a teaching political science at the University of Chicago. Despite his lineage, Strauss’ teachings bear a disturbing similarity to those of the Nazis. For liberals and progressives, neoconservatism is the current Bete noir of American politics. In alleged contrast to the realist school, neoconservative are deemed idealistic, irrational, even insane, yet also uniquely ruthless and cunning. Apart from different propaganda narratives, the reader can be forgiven for failing to notice a significant difference between the neocons and their alleged ideological opponents in the American power structure. In terms of real world outcomes, what we actually find is a remarkable degree of uniformity between “realists” and “neoconservatives,” Democrats and Republicans, with foreign policy differences amounting to a friendly disagreement over exactly how to go about maintaining and expanding US hegemony. Increasingly, Democratic politicians such as Hillary Clinton are being described as “neocons” despite having no historical attachments to Strauss or his philosophy. This indicates a certain level of cognitive dissonance amongst the party faithful; unable to come to terms with the failure of the state capitalist model, they attribute the American empire not to structural factors but a diabolical clique that has usurped American power from its proper guardians. A much more compelling and historically consistent explanation for the remarkable continuity between Democrat and Republican regimes has already been provided: the logic of power is power. For the half-a-million Iraqi children who perished under the sanctions program of Democrat Bill Clinton, or the similar number who perished under the Republican George W. Bush, the distinctions between philosophies of empire are meaningless. The ideological framework for imperialism may change, but the game remains the same. The Power Principle demands that the class that holds power attempts to retain and expand that power. Therefore, ruling classes within one nation find themselves in conflict not only with domestic populations but other nation states. The greatest fear of those who hold power is Anarchy – the loss of control by those who exercise it. When I asked the late historian Howard Zinn what he thought of the word “anarchy” being used as a synonym for chaos, he suggested that anarchic systems are actually much more stable than hierarchical systems. Anarchism is based on horizontal principles of free association and mutual aid, whereas hierarchical systems demand coercion and violence. “Our political systems are in chaos,” Zinn stated. “International relations are in chaos.”14 In the desire to dominate others in order to prevent chaos, chaos is the result. In countries like Iraq, Syria and Libya (or indeed Guatemala, El Salvador, Indonesia and Vietnam) we see the fruits of such strategies. Genocidal violence is not merely an unfortunate byproduct of well-intentioned plans for regime change but a goal in and of itself. It weakens competitors, and is therefore deemed justified. Human life has neither a positive nor a negative value, it is simply irrelevant – another number in the calculus of power. The psychologist Eric Fromm suggested that the desire to control and dominate may produce a necrophilous orientation. Such people are “cold, distant, devotees of ‘law and order’”52 who are excited not by love but death. He is deeply afraid of life, because it is disorderly and uncontrollable by its very nature. To the necrophilous person justice means correct division, and they are willing to kill or die for the sake of what they call justice. ‘Law and order’ for them are idols, and everything that threatens law and order is felt as a satanic attack against their supreme values. Hitler believed that it was in doom that art reached its highest expression. Consumed by sado-masochism and narcissism, hiding at last in his bunker, he devoutly wished for all of Germany to die with him. Afforded the opportunity, Western military leaders may well opt for global conflagration rather than conceding a diminution in their power. For Cold War General Curtis Lemay and nuclear strategist Herman Khan, it seemed perfectly logical to risk the annihilation of the human race in order to “win” the game against the Soviet Union. Missing in their analysis was that the game itself was insane. I began this essay by noting that under the rules of state capitalism, it is rational to regard climate change and other environmental crises as probable force multipliers for interstate conflict. At the same time, militarists make a fundamental error in assuming that current forms of hierarchical organization will continue on indefinitely. Institutional hierarchy has only existed for about 1% of our time on Planet Earth. There is every reason to believe that hierarchical organization, far from being inevitable, is actually unnatural for human beings insofar as it creates massive social dysfunction. Rockefeller’s brand of internationalism is consistent with the rise of supranational institutions like the EU, the IMF and World Bank. The goal is not the elimination of borders but the elimination of any semblance of democratic control over elites. The state has come to function as the ultimate divide and conquer mechanism, reducing the human species to a series of artificial, warring tribes serving a decidedly unpatriotic transnational ruling class. The domestic repercussions of war are typically regarded as an unintended consequence or happy accident for the ruling class; in the process of engaging in imperialism, or defending a population against imperialism, the state must neutralize subversive elements. Viewed through a macroscopic lens, the perceived separation between “domestic” and “foreign” is an illusion. There is no race except the human race, no nation except the world. Does this mean we should embrace a world state? Before examining the question, we should ask ourselves exactly what the state is. The state is a new phenomenon in the human experience. But what of warfare itself? The state has attempted to effect a reconciliation between different classes by arrogating to itself a monopoly on “legitimate” violence. Yet violence alone is not sufficient. Ideologically, the “religion” of the state is nationalism. In lieu of class analysis, nationalism is successful because it appeals to primal human desires for solidarity and belonging, as well as fear of the unknown (“outsiders”). Fear of outsiders is deliberately cultivated by rulers in order to mystify the real cause of the people’s discontent (namely rulers themselves), especially during times of economic/environmental crisis. Ultimately, the state has come to function as a sort of artificial surrogate for real community. The role of state as surrogate helps to explain why the popularity of state leaders tends to rise – often dramatically – during times of war. George W. Bush began his presidential term with an approval rating of 50%; following 9/11, that number skyrocketed to 92% (the highest number ever recorded for an American president since modern polling began).71 The “rally around the chief” effect is no secret, and has been satirized in several Hollywood films such as Canadian Bacon and Wag the Dog. Though egalitarianism alone is not sufficient to bring about peace (sedentary tribal societies often engaged in war, albeit on a far lesser scale than state societies), it is a necessary precondition for the simple reason that the perceived interests of rulers are often radically different – and even diametrically opposed – to those of their subjects. Nowhere is this more apparent than during times of violent conflict. Leaders are celebrated and aggrandized even as their subjects are oppressed and slaughtered. Indeed, Anthropologist R. Brian Ferguson has gone so far as to suggest that hierarchy may be the the most fundamental cause of war. …My view is that in most cases — not every single one — the decision to wage war involves the pursuit of practical self-interest by those who actually make the decision. The struggle can be joined over basic subsistence resources, but it can just as easily erupt over goods available only to elites. In Ferguson’s view, the problem is not limited to competition over resources but the manner in which such competition – or lack thereof – is expressed. Since a world government would constitute the apotheosis of hierarchical organization, such an entity could not possibly put an end to war (which is, after all, simply organized killing by one group of humans against another). If a world state came into existence, propaganda models could simply be reconfigured to reflect the new cultural dynamic: internal enemies would replace external enemies, creating something akin to civil war on a global scale. Kohr rejected the idea of artificial unity in favour of harmony, which he regarded as the natural order of the universe. The unity of a world government would need to be imposed, if for no other reason than consensus between different regions would be impossible (imagine, for a moment, attempting to create a system of law incorporating the Mbuti Pygmies of the Ituri rainforest; the people of Waco, Texas; the Inuit; and the Pashtun tribes of Afghanistan and Pakistan). The result would not be the end of war but the constant reconquest of the global citizenry. Now that we have examined what won’t work, we can start imagining real alternatives to the present system of state competition. As we have seen, the greatest fear of world leaders in anarchy. Though the term is falsely equated with violent chaos, Anarchy is defined by Noam Chomsky as “the closest you can get to pure democracy.”14 Chomsky also interprets anarchism as a “set of principles” rather than an a pure ideology. 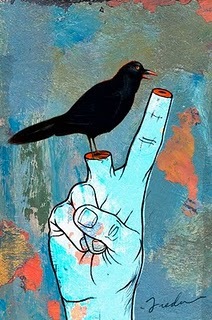 The word itself derives from the Greek Anarkos meaning “without rulers.” Rather than electing a politician who makes decisions for you, anarchists believe that decision-making capacities should lie with the people affected by those decisions. It is often said that if politicians had to fight in wars, there would be no more war. By the same measure, if the CEO of a company polluting a water source was forced to drink that water daily, he or she would presumably be much less likely to dismiss concerns about water pollution. A key issue is accountability. Under our present system, our “leaders” have none. Indeed, we have managed to create a system whereby we begrudgingly elect the most depraved, venal individuals in society to rule over us. Instead of centralized power and competition, anarchists advocate decentralization and cooperation. Decentralized communities can be federated horizontally, thus ensuring stability through a low center of gravity rather than the precarious, ever-shifting power configurations of top-down rule. Anarchism does not demand a “one size fits all” model, and therefore embraces the organic rather than the mechanical. Above all, anarchism demands equality; human beings should not be permitted to dominate their fellows. Other anarchists want little or nothing to do with the state, and believe in acting outside of official political channels. This is the traditional tendency amongst anarchists, and requires no explication. Though anarcho-X-adjective strategies differ significantly, in common with all anarchists is a desire to prevent social dominance hierarchies whereby a privileged class is permitted to oppress the majority. Viewed globally, such oppression takes on the form of genocide and war. The first step in solving a problem is to admit that there is a problem. For the majority, the state and its armies are viewed as a necessary evil. They are imagined to be required, at minimum, to defend populations from aggression by other states. This seemingly rational belief has produced the irrational consequence of possible near term extinction. Once we begin – as a global community – to conceive of states, as well as capitalism, as unnecessary and indeed harmful constructs, we can start to build alternatives from the bottom up. A pessimist view would regard such radical change as unlikely absent a massive global awakening. Yet such an awakening is not far-fetched, if for no other reason than current socio-economic models are unsustainable. Even a fatalist interpretation offers hope – that if humanity survives the coming calamities, our descendants may not automatically repeat the mistakes of our hierarchical, violent age. Anarchism will return us to our basic survival mechanisms as a species – cooperation, equality and peace. These “humanitarian interventionists” studiously ignore our own acts of genocide, first unleashed against Native Americans and then exported to the Philippines and, later, nations such as Vietnam. They do not acknowledge, even in light of the atomic bombings of Hiroshima and Nagasaki, our own capacity for evil. They do not discuss in their books and articles the genocides we backed in Guatemala and East Timor or the crime of pre-emptive war. They minimize the horror and suffering we have delivered to Iraqis and Afghans and exaggerate or fabricate the benefits. The long string of atrocities carried out in our name mocks the idea of the United States as a force for good with a right to impose its values on others. The ugly truth shatters their deification of U.S. power. Nossel, in the contentious year she headed Amnesty International USA before leaving in January, oversaw a public campaign by the organization to support NATO’s war in Afghanistan. She was running Amnesty International USA when the organization posted billboards at bus stops that read, “Human Rights for Women and Girls in Afghanistan—NATO: Keep the Progress Going.” Madeleine Albright, along with senior State Department officials and politicians, were invited to speak at Amnesty International’s women’s forum during Nossel’s tenure. Nossel has urged Democrats to stay the course in Iraq, warning that a failure in Iraq could unleash “a kind of post-Vietnam, post-Mogadishu hangover” that would lamentably “herald an era of deep reservations among the U.S. public regarding the use of force.” She worked as a State Department official to discredit the Goldstone Report, which charged Israel with war crimes against the Palestinians. As a representative on the U.N. Human Rights Council she said that “the top of our list is our defense of Israel, and Israel’s right to fair treatment at the Human Rights Council.” Not a word about the Palestinians. She has advocated for expanded armed intervention in countries such as Syria and Libya. She has called for a military strike against Iran if it does not halt its nuclear enrichment program. In an article in The Washington Quarterly titled “Battle Hymn of the Democrats,” she wrote: “Democrats must be seen to be every bit as tough-minded as their opponents. Democratic reinvention as a ‘peace party’ is a political dead end.” “In a milieu of war or near-war, the public will look for leadership that is bold and strident—more forceful, resolute, and pugnacious than would otherwise be tolerated,” she went on. In a 2004 Foreign Affairs article, “Smart Power: Reclaiming Liberal Internationalism,” she wrote: “We need to deploy our power in ways that make us stronger, not weaker,” not a stunning thought but one that should be an anathema to human rights campaigners. She added, “U.S. interests are furthered by enlisting others on behalf of U.S. goals,” which, of course, is what she promptly did at Amnesty International. Her “smart power” theory calls on the U.S. to exert its will around the globe by employing a variety of means and tactics, using the United Nations and human rights groups, for example, to promote the nation’s agenda as well as the more naked and raw coercion of military force. This is not a new or original idea, but when held up to George W. Bush’s idiocy I guess it looked thoughtful. The plight of our own dissidents—including Bradley Manning—is of no concern to Nossel and apparently of no concern now to PEN. Is this the résumé of a human rights advocate in the United States? Are human rights organizations supposed to further the agenda of the state rather than defend its victims? Are the ideas of “humanitarian interventionists” compatible with human rights? Are writers and artists no longer concerned with the plight of all dissidents, freedom of expression and the excesses of state power? Are we nothing more than puppets of the elite? Aren’t we supposed to be in perpetual, voluntary alienation from all forms of power? Isn’t power, from a human rights perspective, the problem? The current business of human rights means human rights for some and not for others. Human Rights Watch, Amnesty International, Physicians for Human Rights, the Peace Alliance, and Citizens for Global Solutions are all guilty of buying into the false creed that U.S. military force can be deployed to promote human rights. None of these groups stood up to oppose the invasion of Iraq or Afghanistan, as if pre-emptive war is not one of the grossest violations of human rights. The creed of “humanitarian intervention” means, for many, shedding tears over the “right” victims. Its supporters lobby for the victims in Darfur and ignore the victims in Iraq, Afghanistan, Pakistan, Yemen and Gaza. They denounce the savagery of the Taliban but ignore the savagery we employ in our offshore penal colonies or our drone-infested war zones. They decry the enslavement of girls in brothels in India or Thailand but not the slavery of workers in our produce fields or our prisons. They demand justice for persecuted dissidents in the Arab world but say nothing about Bradley Manning. The posing of government shills such as Nossel as human rights campaigners and the marginalization of voices such as Miller’s are part of the sickness of our age. If PEN recaptures the moral thunder of the late Arthur Miller, if it remembers that human rights mean defending all who are vulnerable, persecuted and unjustly despised, I will be happy to rejoin. All systems of power are the problem. And it is the role of the artist, the writer and the intellectual to defy every center of power on behalf of those whom power would silence and crush. This means, in biblical terms, embracing the stranger. It means being a constant opponent rather than an ally of government. It means being the perpetual outcast. Those who truly fight for human rights understand this. The ‘Politics of Naming‘ is whimsical today…. A defiant Moammar Gadhafi has threatened to carry out attacks in Europe against “homes, offices, families,” unless NATO halts its campaign of airstrikes against his regime in Libya. The Libyan leader, sought by the International Criminal Court for a brutal crackdown on anti-government protesters, delivered the warning in a telephone message played Friday to thousands of supporters gathered in the main square of the capital Tripoli. 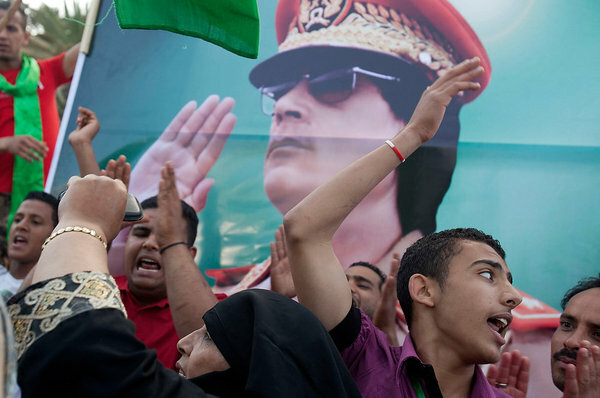 It was one of the largest pro-government rallies in recent months, signaling that Gadhafi can still muster significant support. A green cloth, several hundred meters long and held aloft by supporters, snaked above the crowd filling Tripoli’s Green Square. Green is Libya’s national color. A series of powerful explosions later rattled the heart of the capital, apparently new NATO airstrikes, as Gadhafi supporters cheered, honked horns and fired into the air in the street. Black smoke could be seen rising from the area near Gadhafi’s Bab al-Aziziya compound. Gadhafi spoke from an unknown location in a likely sign of concern over his safety. Addressing the West, he warned that Libyans might take revenge for NATO bombings. “These people (the Libyans) are able to one day take this battle … to Europe, to target your homes, offices, families, which would become legitimate military targets, like you have targeted our homes,” he said. It was not immediately clear whether Gadhafi could make good on such threats. In the past, Gadhafi supported various militant groups, including the IRA and several Palestinian factions, while Libyan agents were blamed for attacks in Europe, including a Berlin disco bombing in 1986 and the downing of Pan Am Flight 103 over Lockerbie, Scotland, that killed 270 people, mostly Americans. Libya later acknowledged responsibility for Lockerbie. Al-Qaida and other jihadi groups have opposed Gadhafi since he cracked down in the late 1990s on the Islamist Libyan Islamic Fighting Group which sought to replace his regime with an Islamic state. A U.S. State Department spokesman, Mark Toner, said the U.S. would take Gadhafi’s threat of attacks seriously, as his regime carried out such actions in the past. Toner said he did not know if there was intelligence to indicate Gadhafi’s regime would be able to carry out such attacks. “This is an individual who’s obviously capable of carrying these kinds of threats, that’s what makes him so dangerous, but he’s also someone who’s given to overblown rhetoric,” Toner told a news conference in Washington. Friday’s rally came just four days after the International Criminal Court issued arrest warrants for Gadhafi, his son Seif al-Islam and Libyan intelligence chief Abdullah al-Sanoussi for crimes against humanity. International prosecutors allege government troops fired on civilian protesters during anti-Gadhafi street demonstrations earlier this year. The popular uprising has since turned into a protracted civil war, with anti-government rebels controlling much of eastern Libya and parts of Libya’s western mountains. NATO has been bombing government-linked targets since March. In his speech Friday, Gadhafi denounced the rebels as traitors and blamed them for Libya’s troubles. “Tunisians used to work for Libyans. What brought you to this stage? The traitors,” he added. He called on his supporters to march on rebel strongholds, including the western mountain area and the port city of Misrata, both in the otherwise Gadhafi-controlled western Libya. “We must end this battle fast,” he said of the attempts to oust him from power, which began with an uprising in mid-February. Gadhafi’s speech signaled that mounting international pressure, including the arrest warrants against him, have made him only more defiant. His son, Seif al-Islam, who like his father is a wanted man, denied in a TV interview that either of them ordered the killing of civilian protesters in Libya, as prosecutors charge. The younger Gadhafi told Russian news channel RT in an interview posted online Friday that “most of the people” died when they tried to storm military sites, and that guards fired on them under standing orders to protect the bases and themselves. However, documents from the International Criminal Court outline multiple instances in which the tribunal prosecutors allege government troops fired on civilian protesters during anti-Gadhafi street demonstrations earlier this year. The younger Gadhafi had once been viewed as a reformer by the West and was being groomed as a possible successor to his father. “This court is a Mickey Mouse court … For me to be responsible for killing people, it was a big joke,” he told the Russian state-funded network. The three are accused of orchestrating the killing, injuring, arrest and imprisonment of hundreds of civilians during the first 12 days of an uprising to topple Moammar Gadhafi from power, and for trying to cover up their alleged crimes. Presiding Judge Sanji Monageng of Botswana has said that hundreds of civilians were killed, injured or arrested in the crackdown, and there were “reasonable grounds to believe” that Gadhafi and his son were both responsible for their murder and persecution. “Nobody ordered. Nobody. The guards fired. That’s it. … The guards were surprised by the attacking people and they (started) … firing. They don’t need an order to defend themselves,” he said. Seif al-Islam accused Western nations of intervening in Libya because they are after the country’s oil and other resources. He said the goal is “to control Libya,” and he vowed to fight on. Yet tonight, we take comfort in knowing that the tide of war is receding. Fewer of our sons and daughters are serving in harm’s way. 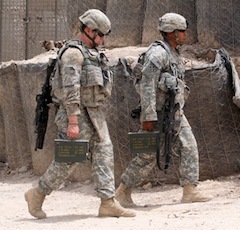 We have ended our combat mission in Iraq, with 100,000 American troops already out of that country. Indeed, the Irainian-backed group Kataib Hezbollah, which claimed responsibility for the attack earlier this month, said its attacks on U.S. troops were aimed at stopping the “occupation interference” in Iraq’s affairs and forcing the U.S. to abide by the withdrawal deadline. And while it’s unclear how much Muqtada al-Sadr’s supporters are participating in attacks on U.S. forces, he has pledged to unleash his Mehdi Army if the Americans stay past 2011. One analyst has also said that he has seen an increase in the use of armor piercing IEDs called explosively formed penetrators, or EFPs. “The increase in attacks shows that Iranian-backed cells enjoy greater freedom of movement than they have in the past,” said Michael Knights, of the Washington Institute for Near East Policy. Secular, nonsectarian Sunni militants, men who consider themselves Iraqi nationalists for resisting a foreign military presence, drift into the company of Iraq’s al-Qaeda contingent when seeking help to lash out at U.S. forces. This drift in effect bolsters al-Qaeda radicals, allowing them to pursue more easily sectarian violence against Shi’ites. Increased sectarian aggression on the part of al-Qaeda produces a violent response from Shi’ite militias such as the Mahdi Army and the Iraqi government, whose security forces are quick to indulge in brutal crackdowns against Sunni communities where militants are thought to be active. Whether sectarian tensions in Iraq will rise to level of the civil war days of 2006 and 2007 if the Americans leave is uncertain but unlikely. However, there is one certainty if U.S. troops withdraw on time: After Dec. 31, 2011, Iraqi militants will no longer launch attacks on and kill American soldiers. WASHINGTON — President Barack Obama has approved the use of armed drones in Libya, authorizing U.S. airstrikes on ground forces for the first time since America turned over control of the operation to NATO on April 4. It also is the first time that drones will be used for airstrikes since the conflict began on March 19, although they have routinely been flying surveillance missions, Defense Secretary Robert Gates told reporters at a Pentagon briefing Thursday. He said the U.S. will provide up to two 24-hour combat air patrols each day by the unmanned Predators. Marine Gen. James Cartwright, vice chairman of the Joint Chiefs of Staff, said the drones can help counteract the pro-Gadhafi forces’ tactic of traveling in civilian vehicles that make it difficult to distinguish them from rebel forces. Gates rejected the notion that the approval of drone strikes means that the U.S. will slowly get pulled back into a more active combat role, despite Obama’s promise to merely provide support for NATO. U.S. forces played a lead role in the early days of the conflict, launching an onslaught of cruise missiles and bombs on Gadhafi’s surface-to-air missiles sites and advancing regime troops. But with American forces stretched by the wars in Iraq and Afghanistan, as well as the humanitarian operations in Japan, the Pentagon turned the mission over to NATO, saying it would only do limited airstrikes to take out air defenses. The U.S., said Obama, would no longer do airstrikes to protect the civilian population. Gates said that bringing in the Predators will give NATO a critical capability that the U.S. can uniquely contribute. He said Obama has been clear that there will be no U.S. boots on the ground and that the main strike role would belong to the allies. The first Predator mission since Obama’s go-ahead was flown Thursday but the aircraft – armed with Hellfire missiles – turned back due to poor weather conditions without firing any of its munitions, Cartwright said. Gates, who publicly expressed skepticism about getting involved militarily in Libya before Obama endorsed the limited intervention, said “the real work” of overthrowing Moammar Gadhafi will have to be done by the Libyans themselves. While he acknowledged the conflict “is likely to take a while,” Gates also said the ongoing sanctions, arms embargo and NATO-led offensive have weakened Gadhafi’s military and eaten away at his supplies and cash. Over the long term, Gates said, that will hurt the regime’s ability to strike back at oppositions forces, if they rise up again in other cities. At the same time, however, Gates said the administration’s decision to provide $25 million in nonlethal military assistance to the rebels did not signal a deeper U.S. commitment to anti-Gadhafi forces whose makeup, objectives and motives are still not fully understood in Washington. “I’m not worried about our canteen technology falling into the wrong hands,” he joked. In other comments, Gates did not rule out major military program cuts to meet Obama’s goal to slash another $400 billion from the country’s national security spending over the next 12 years. But he laid out some programs he believes are vital, including the new Air Force refueling tanker and the replacement of some Navy ships. “The worst of all possible worlds, in my view, is to give the entire Department of Defense a haircut – basically (saying) everybody is going to cut X percent,” Gates said, adding that he’s had one meeting with staff on the issue. Instead, he said the Pentagon must lay out options and the risks involved if particular cuts are made and how they would affect military missions. He added that he does not know how much of the cut the Pentagon will be expected to take. The Bolivian President and a Russian political leader have launched a campaign to revoke Obama’s honour after the US attacked Libya. Liberal Democratic Party of Russia leader and Vice-Chairman of the State Duma Vladimir Zhirinovsky released a statement today calling for the Nobel Prize Committee to take back the honour bestowed on US President Barack Obama in 2009.Zhirinovsky said the attacks were “another outrageous act of aggression by NATO forces and, in particular, the United States,” and that the attacks demonstrated a “colonial policy” with “one goal: to establish control over Libyan oil and the Libyan regime.” He said the prize was now hypocritical as a result.Bolivian President Evo Morales echoed the call: “How is it possible that a Nobel Peace Prize winner leads a gang to attack and invade? This is not a defence of human rights or self-determination.”Morales won the Gaddafi International Prize for Human Rights in 2006.He is amongst a number of left-leaning Latin American leaders who have denounced the attacks against Libya. Hugo Chavez of Venezuela, Rafael Correa of Ecuador, Daniel Ortega of Nicaragua and Cristina Fernandez of Argentina have all criticised western media coverage of the Libyan crisis.